You know how much more accurate weather forecasts are these days than back when we (I) were young and they were pretty much just hopeful guesses? Well not today. We were meant to have a fine morning and then rain and hail from early afternoon; but in fact it's been the opposite, except (thankfully) for 'rain and hail' read 'showers'. But we still had a very enjoyable walk. We gathered in the ferry terminal at Matiatia for our friendly welcome and ritual shoe scrub and spray, and set off straight through the bush, up the hill beside the road. We emerged at Delamore Drive, which is one of the fancier roads on the island - where 'fancier' means discreetly linking multi-million dollar properties tucked below the skyline and at the end of long driveways behind electric gates. We followed the road for a while before rejoining the track that led down lots of steps to some splendid views of Owhanake Bay - even today, under a grey sky, looking improbably blue. We trailed around the edge of the bay, stopping to view our first sculpture, a piece made of railway ties and rusted metal, in the shape of a dog and with, according to guide Sue who had done the homework, many cultural references that included Maori, Cook, species extinction and other arty stuff, none of which I could see myself. Nor could many others, I suspect - especially the woman who thought it was a horse (and was dogged (ha!) in her interpretation, even when I pointed out the droopy ears: "My friend's horse has ears just like that!" she insisted, unconvincingly). 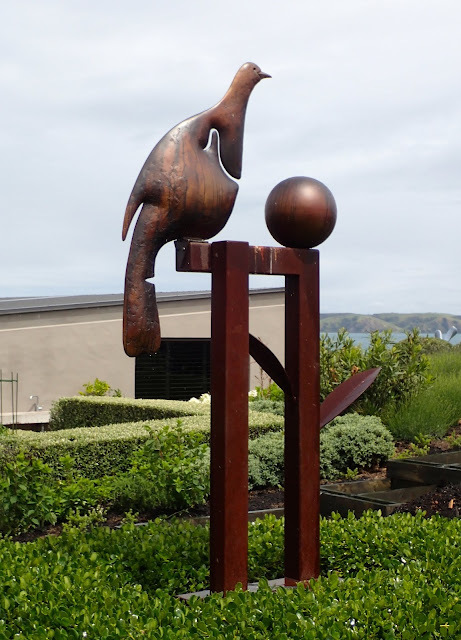 But better was to come, at the top of the headland where we were allowed onto the property of a generous rich person to view the sculptures there. My goodness, it was a magnificent house. Big, low, modern, lots of glass to make the most of the wonderful views in all directions, a lovely and super-neat garden heavy on the topiary, swimming pool, the lot. Plus of course some beautiful sculptures, the best of which was a gorgeous fat bronze kereru, second place going to some moulded glass fish. We were even allowed into the courtyard (on condition that no-one left nose-prints on the windows - though there was plenty of sideways staring nonetheless into the interior which included, I saw, a dining table with seating for twelve. It's another world). Even on a dull day, it was spectacular. Then we continued around the headland, past other enviable houses, along cliffs overlooking little beaches and past magnificent pohutukawa trees that in a few weeks' time will be in full bright red flower, framing blue sea and green islands - I must go back for that. Oystercatchers peeped, skylarks trilled, grey warblers er, warbled, and tuis flew past with a whoosh! Finally, as the weather turned brighter and brighter, we ended up back at Matiatia, another walk ticked off - and, in my case anyway, very conscious of the fact that the doughty souls starting the circumnavigation today were only halfway through their first section of the 100km circuit they're doing of the island. Maybe next year?